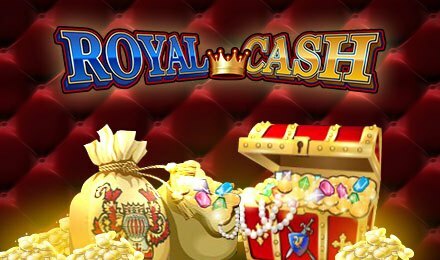 Powered by iSoftBet, Royal Cash slot is a 5 reel and 50 payline game, taking you on a thrilling adventure to meet the royals. On your arrival at Vegas Spins Casino, launch the game on your mobile, desktop or tablet for a wonderful gameplay! On the reels, enjoy symbols like; Gold Accessories, Bags of Jewels, Crowns, Treasure Chests, Kings and Queens. As you spin the reels, these symbols combine in threes to award wins. The top paying symbols are the King and Queen. For a five-symbol combination, the King awards 2,000 coins and the Queen awards 1,000 coins. Click on the gear to open the Bet Field. Pick the bet you prefer and be ready to roll the reels! Autoplay is at hand, enabling you to set the game on auto. Amount of Paylines Selection: All paylines are fixed and cannot be altered. Coin Values: Bet values range from £0.50 to £250.00. Royal Cash has five wild symbols, in which four of them are multiplier wilds. The standard wild symbol replaces all other symbols except for the scatter, as well as the other four wilds. These symbols land on the 5th reel to boost your wins, and appear in values of 2x, 3x, 5x and 10x. While free spins are in play, wins are boosted by multipliers of 2x, 3x, 5x and 10x. Landing scatters during the play of the feature will retrigger the feature.